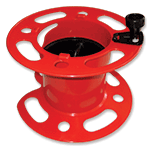 Compact nozzle provides superior pulling and scrubbing in 1-1/2" to 6" ID drains. 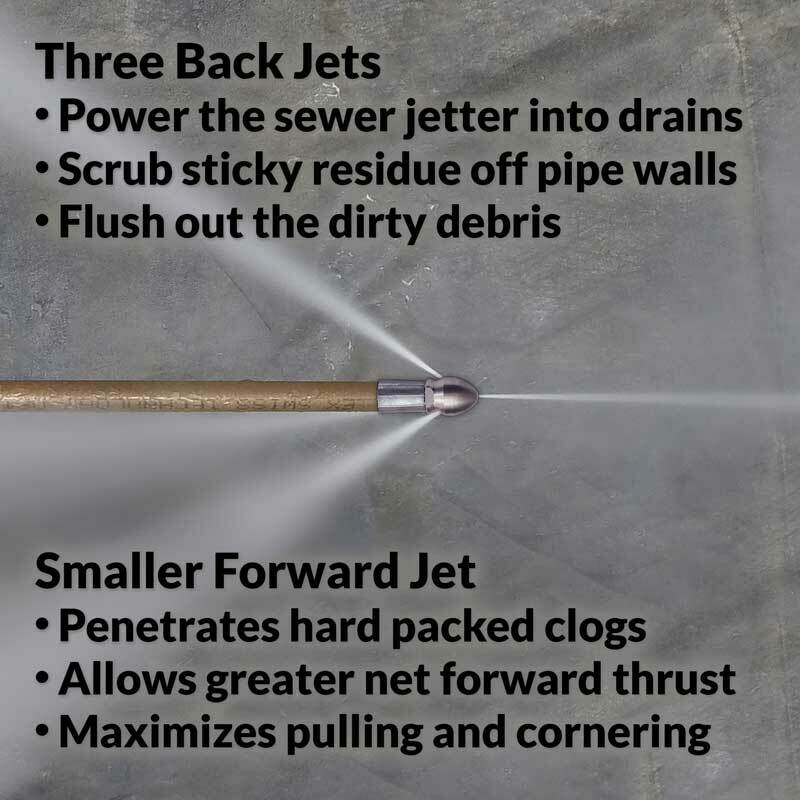 Note: this Commercial sewer jetter is identical to the Residential model, except for its higher-flow nozzle. 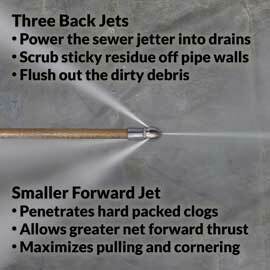 Nearly all pressure washers less than 3.0 GPM will get much better results with a Residential drain cleaner. I had a 20 foot section of 3 inch sewer pipe frozen solid. In a total panic I searched google for solutions. Clog Hog's website came up. I called Clog Hog and talked to one of their reps. I told the make and model number of my pressure washer. 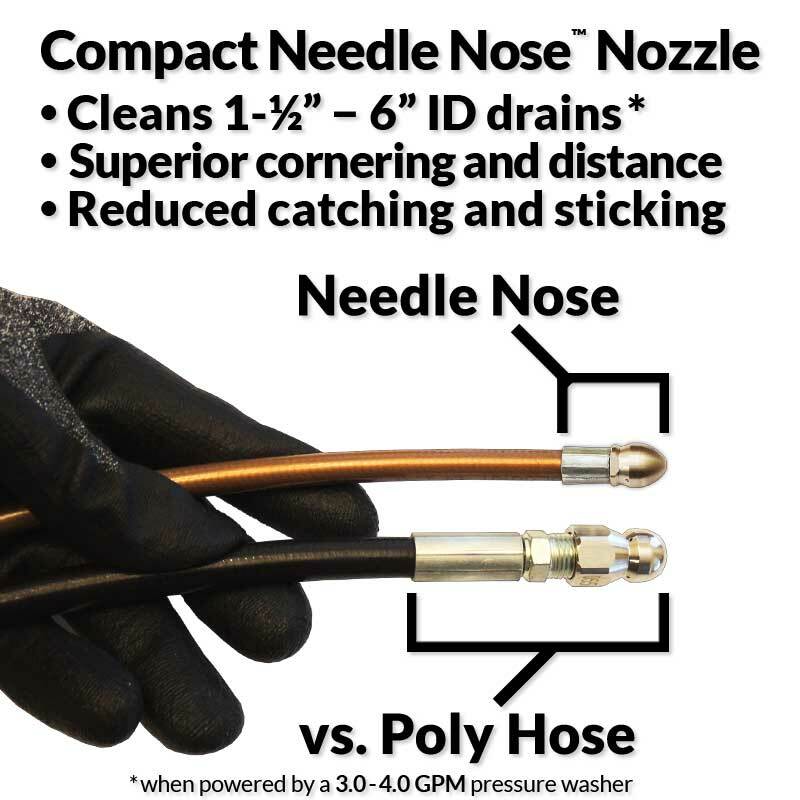 The rep made sure I got the right hose and nozzle for my application. The rep shipped it 2nd day air and it arrived promptly when he said it would. 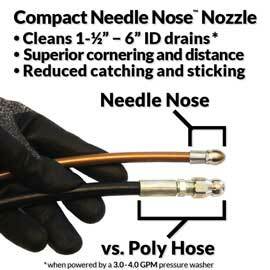 That day I set up my pressure washer and advanced those down my clean out on my sewer pipe. You could actually watch the hose advance inch by inch eating away at the ice. Pure magic. This thing worked unbelievably well. The water I was using was cold water, not even heated and it still chewed through that ice. Total time it took was about 20-25 minutes. 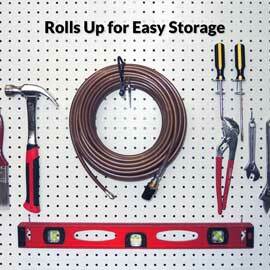 Its not cheap but way cheaper then a plumber. My sincere thanks to the rep and people at Clog Hog. If you have an ice jam, this is your easiest fix. I was skeptical about the efficiency of the 100' Clog Hog to clear my patio drains but, to my surprise, it worked very well until it ran into solid root from a nearby tree. Had to dig up pipe to discover roots had crushed and ruptured the pvc pipe. 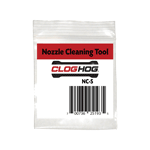 There is a lot of crap out there that does not work but, the CLOG HOG WORKS GREAT! 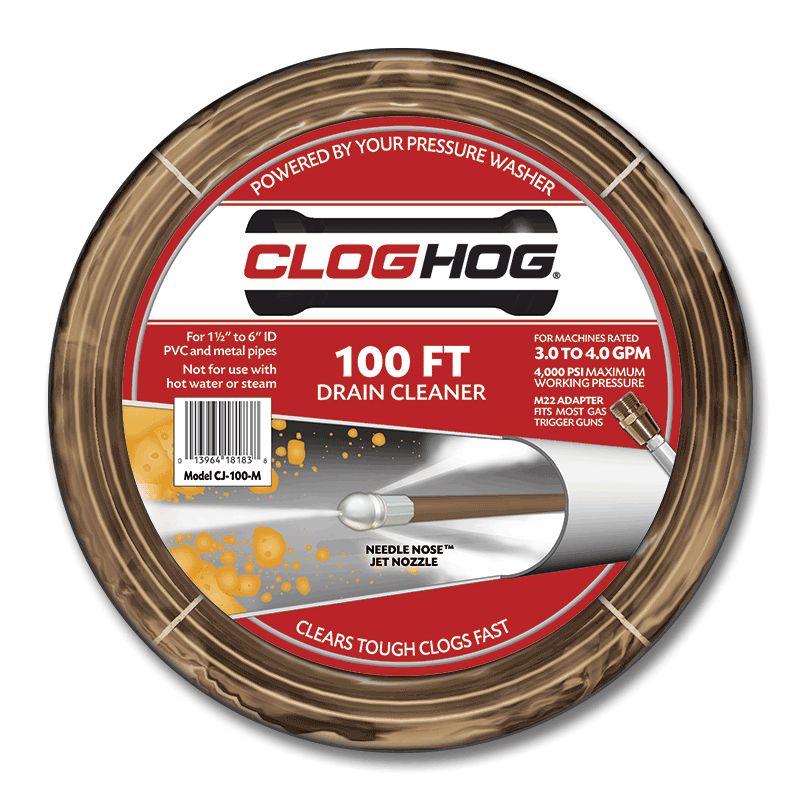 Also, the followup phone call from Clog Hog after the order was placed to be certain that my pressure washer unit will be compatible was unexpected and appreciated. Great company and great product. Will recommend. 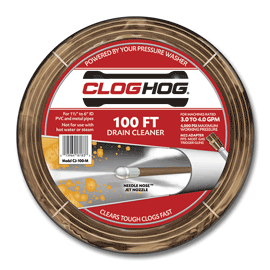 The Clog Hog worked as was advertised. 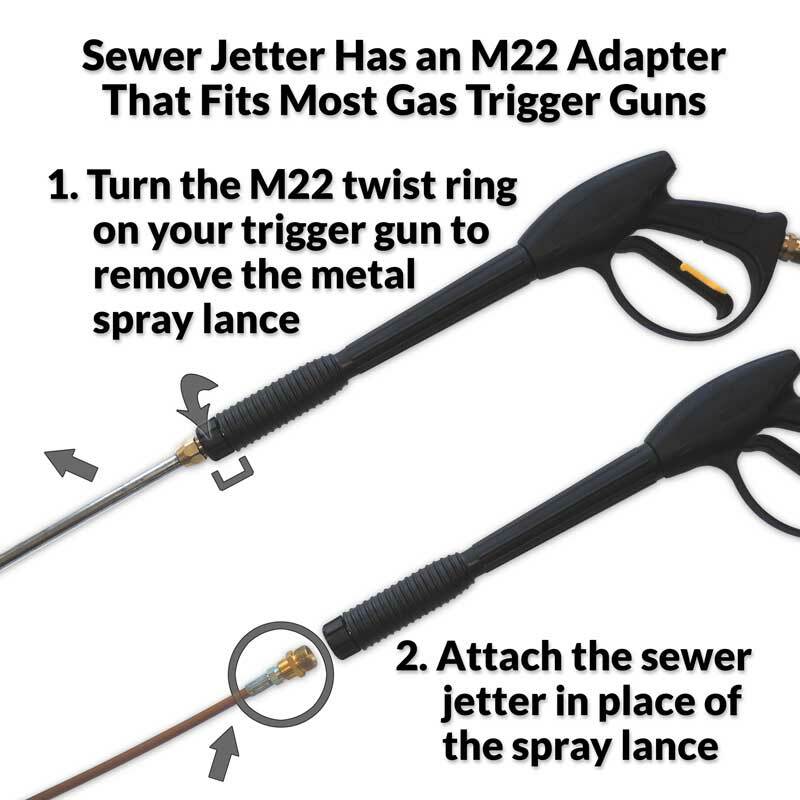 I was able to connect it to my pressure washer per the directions. It cleaned out the clogged drain within about 10 to 15 minutes. I had tried the conventional machines several times with no luck. 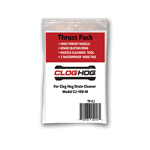 I would recommend the Clog Hog to everyone. Using it only one time will certainly pay for itself. I am a Very satisfied customer. The Clog Hog cleaned my 4 foundation drains that were clogged in multiple place with packed red clay. Everything worked as advertised. The instructions and helpful hints were very useful. Could not ask for anything more. First the the company reps went out of their way to be sure I received the correct parts that matched my pressure washer and drain I needed to clean. They even talked about operation and tricks to help clean the drain. 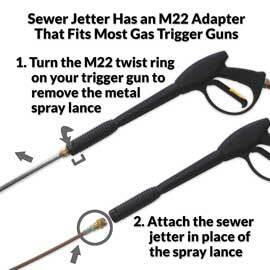 The tool worked great. 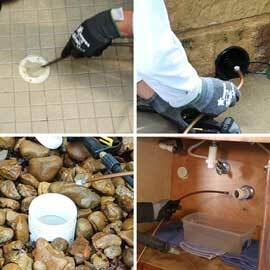 Drain clean and flowing water again. 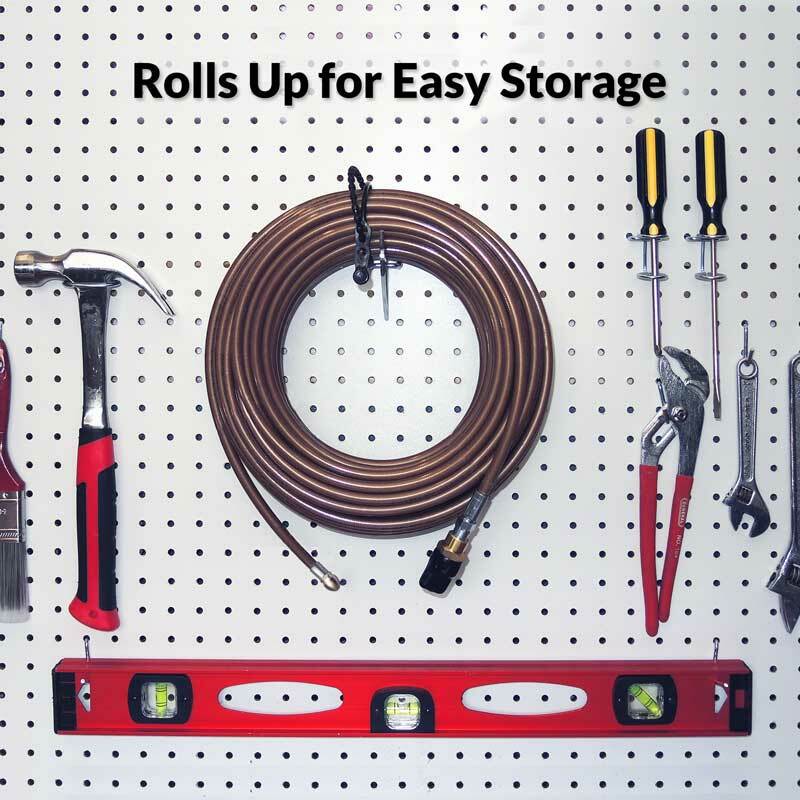 Great tool, but what impressed me the most was the customer service. 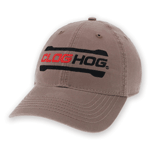 In this day and age we need more companies like Clog Hog.